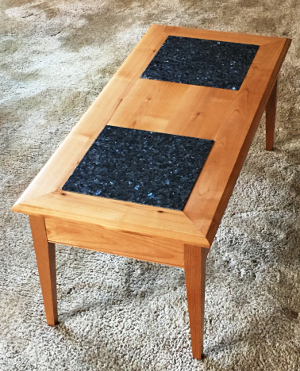 Alder Coffee Table with Granite inserts - Choose your own granite! ...made out of some Koa she had brought with her. 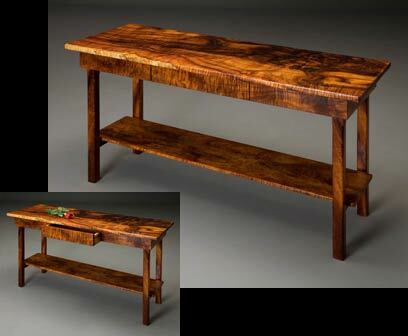 Koa is a rare wood which is only harvested from dead or dying trees in Hawaii. It is VERY special! The customer talked with Don at length about the type of tools he had, and checked out the Solutions in Wood web site, then came back and said, "You are the one who can make my table." The top is made from a 21 inch wide board which she had hidden for 15 years! Just look at that grain! 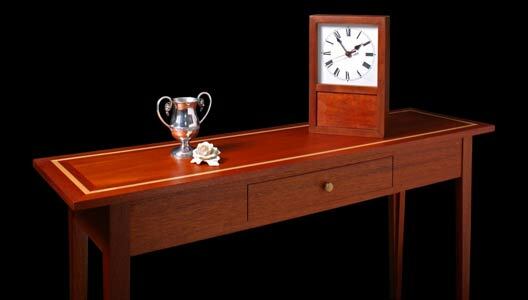 Upon delivery of the finished table, the customer was very excited, and exclaimed, "This far exceeds my expectations!" How we LOVE our happy customers. He (and the kids) wanted a big TV screen to watch the sports channel. When she was entertaining guests she wanted a decorative piece with a surface on which to set hors d�oeuvre trays. 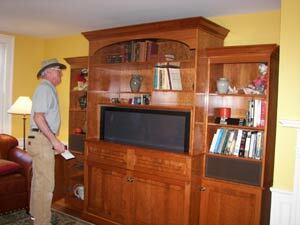 He called upon Solutions in Wood to create an entertainment center with a lift for a large screen plasma TV, which would match their antique cherry furnishings in their beautiful "Southern Living" style home. The waist molding matches the chair rail in the room. 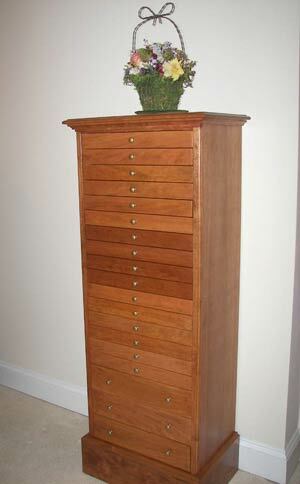 A beautiful piece of furniture in any home, whether entertaining or not. The whole family is happy, now. 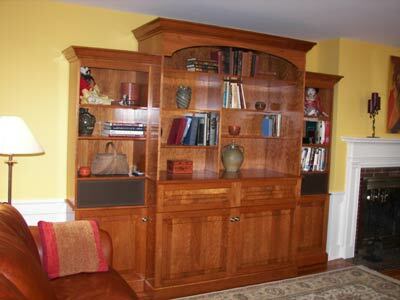 The wood is cherry; finish is natural. This customer had been shopping for a jewelry chest that would hold all her jewelry in one place, rather than having multiple jewelry boxes. There were lots of choices, but none would go with her bedroom set, or had the right configuration of drawers or spaces for her jewelry. 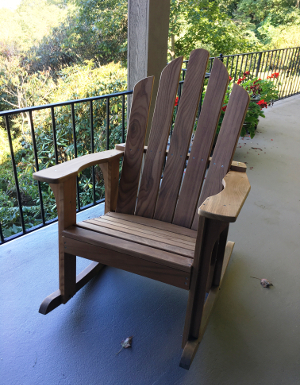 Then she saw an ad for Solutions in Wood in the Carolina Home and Garden magazine. The drawers are fitted with interchangeable standard sized jewelry trays with multiple configurations of sizes and spaces. 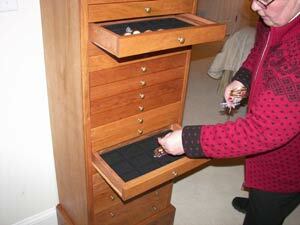 Our customer was very excited as she arranged and rearranged her jewelry and the various trays. We LOVE our happy customers! 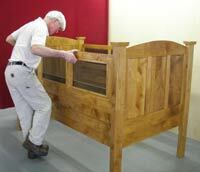 Solutions in wood was asked to design and make a twin sized bed with drop sides and a furniture look for a special needs child. It was important that it be safe and not have an 'institutional' look. The handmade special bed accommodates a single standard mattress (39" X 74" X 8") and spring and is made out of beautiful and sturdy Alder. 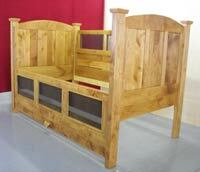 The bed stands 50" high, 78" long, 42" wide, and is a convenient height to be used for a changing table. 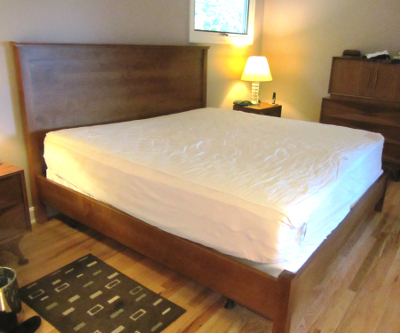 The headboard and footboard extend below the mattress, reducing the chance of entrapment, and a special board along each side on a piano hinge, nearly eliminates the gaps between the side rails and the mattress. Both side panels slide down to allow entrance or care giving from either side. The side panels have strong mesh fabric in the openings, so the child can easily see out and the sides are light weight for raising and lowering. No institutional looking slats or bars! A very simple push/pull mechanism releases and secures the side rails in place. 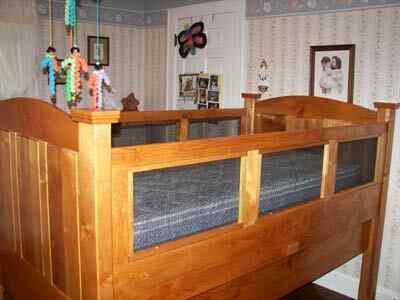 Our customers were very excited and thrilled when the bed was delivered, and now the whole family sleeps comfortably and peacefully knowing their special child will be safe in her bed each night for the rest of her life. 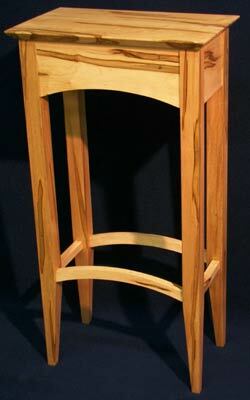 This was my own design, built from mahogany, with a maple inlay, for an artist gallery show. The dimensions are 50" long x 14" wide x 30" tall. We had it professionally photographed for the Carolina Home and Garden Magazine, and made into a postcard. 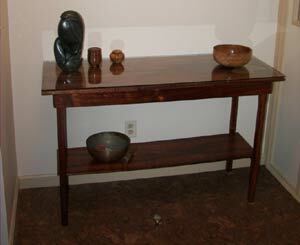 It now makes an ideal show piece for the entry hall of our Hendersonville, NC home. These customers came from more than 25 miles away to the Solutions in Wood shop at 422 South Whitted Street in Hendersonville. They had drawn a design for a small occasional table with graceful curves, and wanted it in a figured maple, to fit in a very small special space. The top was to be only 10" x 16", and 32" tall. 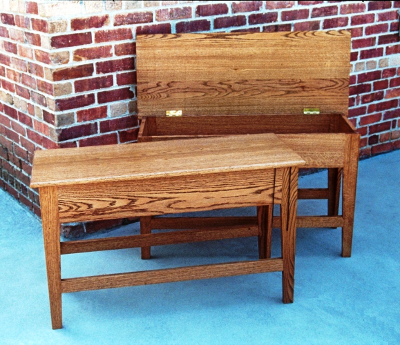 When they saw the Ambrosia maple vanity, that�s the wood they wanted their table to be made of! They were thrilled with the finished product! 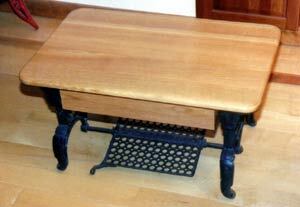 This customer had an old sewing machine base that she had envisioned being made into a table. 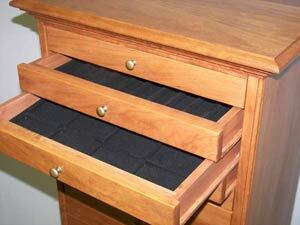 I designed it in white oak, with a small drawer, to fit her needs and vision. She was ecstatic! A friend brought some beaded pine paneling left over from another project, and a sketch. He wanted a hutch made from this. 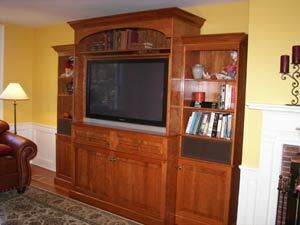 It was a challenge, because it was not furniture grade wood. 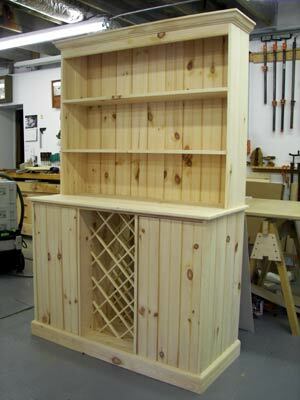 However, Solutions in Wood met the challenge and created this very special Knotty Pine Hutch with wine rack. It is 49 1/2" wide, 77 1/2" high and 20" deep. Our friend was delighted as he took it home in his pickup truck.